March Madness is heading to the heart of Texas this year, as San Antonio plays host to the 2018 Final Four. The semifinal games tip off on March 31, with the championship game holding court on April 2, 2018. 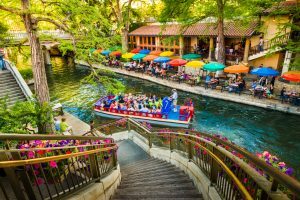 Known for its gorgeous River Walk, incredible Tex-Mex cuisine and historical sites like the Alamo, San Antonio is the jewel of Texas, showcasing a blend of the “bigger is better” attitude we’ve all come to associate with the Lone Star state, along with a refined sophistication and awe-inspiring sights you won’t find anywhere else. If you’ve already purchased your NCAA Final Four 2018 tickets – or are even still weighing your options – we’ve got your guide to all of the best places to eat, drink and have a good time in beautiful San Antonio. 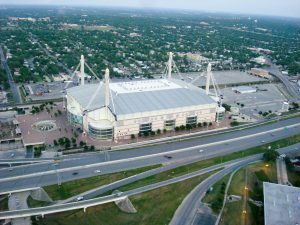 The former home of the San Antonio Spurs, the Alamodome is a perfect venue to host the Final Four, featuring all of the amenities you expect from today’s most sophisticated basketball arenas and located right near the heart of downtown San Antonio. The Alamodome recently completed the most extensive renovation project in its 24-year history, adding four 60-foot-long high-definition video boards and a 360-degree high-def ribbon that circles the entire arena. Wherever your seats are, there’s no way you’ll miss a single moment of the action on the court. Of course, some hoops fans want to capture the magic with their phones, and the venue’s new Wi-Fi enhancements will guarantee you stay connected all game long. The most impressive improvement that fans are sure to notice, though, is the expansion of both the east and west concourses, each one featuring exterior beer gardens if you want to take a break from the game and get a little fresh air. Texas may be infamous for its high humidity and triple-digit heat indexes, but you won’t find any of that muggy weather in the springtime. In fact, spring is the best time to visit San Antonio, with historical daily high temps hovering around the high 70s. That’s not just good weather – that’s perfect weather. This spring, in particular, is special because the city will be celebrating its tricentennial. 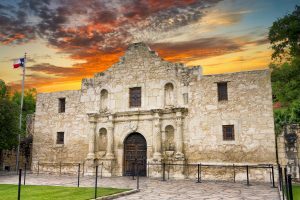 That’s right, at 300 years old, San Antonio is older than the United States itself. 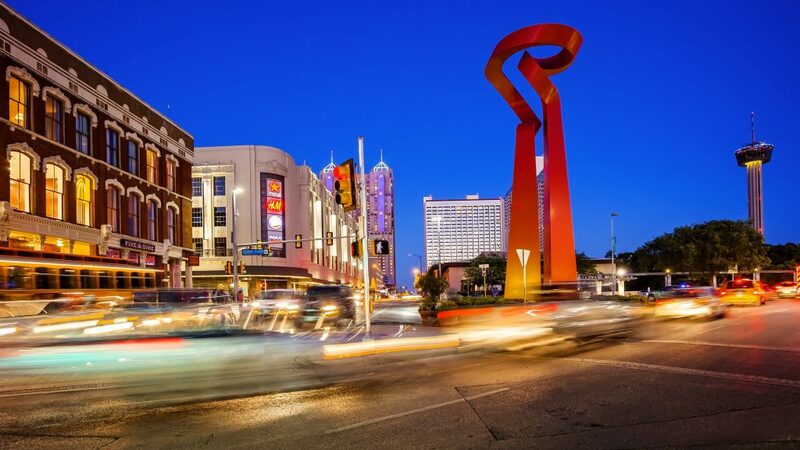 That mix of Southwest history and modern sensibility can be found all over the city, from its famed River Walk to its acclaimed museums and trendy neighborhoods. If you’re looking for an intellectual diversion from college hoops, be sure to stop by one of the special art exhibits on display during the tricentennial celebration. For more information, be sure to check out the city’s main “San Antonio 300” website. Of course, what trip to San Antonio would be complete without a visit to the famed Alamo. This World Heritage Site is an experience all its own, with its distinctive architecture and important role in not only Texas history but the U.S., as well. Originally a Spanish mission, the Alamo was converted into a military fort and served as the site of the famous Battle of the Alamo in 1836 between the Mexican army and Texan soldiers. History buffs no doubt already know the event as the last stand of American legends like Davy Crockett and Jim Bowie, but there’s so much more to learn and see, so be sure to stop by for a tour – just don’t ask about the basement. The Alamo’s iconic, for sure, but what’s the one can’t-miss stop on your visit to San Antonio? The River Walk. 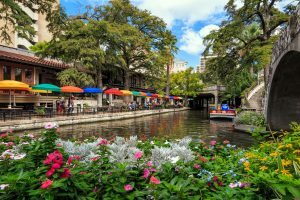 Stretching 15 miles across the city – including through the heart of downtown, you could spend an entire trip just exploring all of the different shops, restaurants and live entertainment the River Walk has to offer. Pedestrian sidewalks line both sides of the San Antonio River, allowing visitors to stroll alongside the waterway and connect them directly to some of the most popular tourist sites in the city, including Marriage Island, La Villita and the Arneson River Theater – where spectators can sit on the south bank of the river to watch concerts, plays and even operas. If walking’s a little too slow for your speed, charter a boat tour down the river. Your guide will be able to point you in the direction of all the best places to shop and eat and give you a little taste of the city’s extensive history. What would a trip to San Antonio be without some Tex-Mex? The city is filled with plenty of options, but if you want to get your fix of fajitas, enchiladas and other Tex-Mex staples, avoid the tourist traps and go where the locals eat. Mi Tierra Cafe and La Fonda on Main are both fixtures of the San Antonio restaurant scene, providing incredible cuisine for locals and visitors alike. Both claim to have the best food in all of San Antonio, so why not try them out and decide for yourself? If you’re looking for local fare that’s a little more down to earth, you can’t go wrong with Tito’s. Their signature dishes, like the Chipotle Cream Chicken, will scratch that Tex-Mex itch at a fraction of the cost. Beyond the Alamo, the River Walk and Tex-Mex, there’s one thing that San Antonio is known for: margaritas. Just about any local restaurant worth its salt will have serviceable margaritas, but if you want truly transcendent cocktails, head over to La Fogata. There’s a reason this San Antonio institution gains accolades for its margarita drinks year after year: They’re second to none. With so many varieties available, anyone can find the perfect margarita that hits just the spot. And since this is Texas, diners can even order a special 52-ounce glass that’s guaranteed to quench your margarita thirst. There’s so much to see and do in San Antonio that it’s impossible to cover it all in one weekend. But between the games, be sure to explore as much of the city as possible and enjoy everything it has to offer. It’ll be a Final Four experience you’ll never forget. An exciting array of food, drink, and assorted fun if you're heading to town for the Final Four. Stunning rooms of all sizes and sounds in the City by the Bay. Classic Southern fare and tons more to try in the South's ever-expanding epicenter of sports and shows.